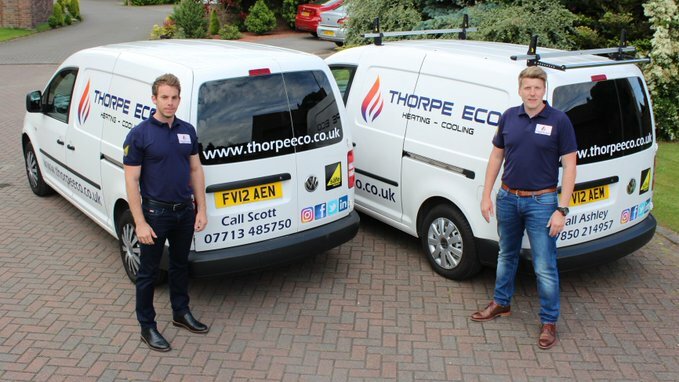 Thorpe Eco is a family run company operating in the East Riding of Yorkshire operating since 1985 as a Sole Trader D J & P Thorpe Plumbing & Heating specialising in installation, service and repair of complete central heating systems both domestic and commercial. With David’s Two Sons Scott & Ashley coming back into the business after traveling the UK gaining experience in all aspects of the Plumbing & Heating / Gas industry, Domestic and Commercial. Offering more services and unequaled response to the customers needs. Using the knowledge and skills acquired over the past 15 years in the industry. Thorpe Eco Ltd can offer the highest-level of services and products available on the market today. Here at Thorpe Eco, we are specialists in a wide range of plumbing and heating services to both domestic and commercial customers throughout Yorkshire, Lancashire and Lincolnshire. With 40 years' experience in the plumbing and heating industry behind us, we are experts in repairing and maintaining aged boilers. However, if your boiler is beyond repair, we will give you a competitive no obligation quote for a replacement boiler. Thorpe Eco engineers are time served (2010 award winning) apprentices within the gas industry and have the relevant training to keep up to date within an ever-changing industry. Using their experience and their continuous training they strive to exceed the expectations of everyone of Thorpe Eco’s customers. Thorpe Eco can supply & install all makes and models of boiler. When installing your new appliance, we carry out system flushing and offer upgrades to your central heating such as controls, radiators and system filters. We have the knowledge to make sure your system is up to date and preforming efficiently. We can install complete heating systems to small properties, to rows of houses or blocks of flats, even commercial heating and hot water systems including HIU (heat interface units). Our Engineers have experienced dealing with systems including high rise tower blocks at the Olympic village, London. Thorpe Eco can offer its customers an extended Warranty on any of the boilers it fits. To keep your manufactures warranty valid Thorpe Eco will offer appliance service plans and reminders to suit any customer’s financial situation. Thorpe Eco also offer an unbeatable after sales service guarantee. Our reputation has been developed through hard work and reliability. Thorpe Eco Gas Safe engineers work with all the leading types of boilers, and we offer a wide range of services for you to choose from. We also specialise in electrical fault finding, so whatever your heating problem might be, we're here to find the solution. Make sure you have your gas appliances serviced annually to keep them preforming efficiently. It costs less than you think at around £1.50 a week on average. You have the peace of mind your loved ones are safe and sound from potential dangers of any faulty gas appliances. Our key purpose is to create and deliver value for our customers and to earn their lifetime loyalty. Our success depends on our people and the strong values in customer service we strive to maintain.